Prior to gaining Buddhahood, Amida was known as Hōzō Bosatsu (Bodhisattva); the 48 vows are attributed to Hōzō. Amida, the Lord of the Western Paradise, is often depicted flanked by two bodhisattvas, Avalokitesvara (Kannon), and Mahasthamaprapta (Seishi). This wel-known grouping is called the Amida Raigō Triad. 48 vows taken by Hōzō Bosatsu (Skt. = Dharmakāra), who later becomes Amida Buddha. These 48 vows are closely associated with Mahayana traditions and Japan’s Pure Land sects. In Tibet, there are 18 root vows and 46 branch vows taken by lay followers, monks and nuns. Click here to jump directly to the Tibetan vows. As told in the Infinite Life Sutra (Muryōjukyō 無量壽經; Skt. Sukhavatiyuha Sutra), Hōzō Bosatsu made 48 Great Vows promising to create a Pure Land (the Western Pure Land of Ultimate Bliss), and guaranteed rebirth in the Pure Land to anyone who would recite his name with utmost sincerity, particularly at the time of their death. Dharmakāra fulfilled his 48 vows and thereafter attained Buddhahood and became Amida (Amitabha) Buddha. If, when I attain Buddhahood, there should be in my land a hell, a realm of hungry spirits or a realm of animals, may I not attain perfect Enlightenment. If, when I attain Buddhahood, humans and devas in my land should after death fall again into the three evil realms, may I not attain perfect Enlightenment. If, when I attain Buddhahood, humans and devas in my land should not all be the color of pure gold, may I not attain perfect Enlightenment. If, when I attain Buddhahood, humans and devas in my land should not all be of one appearance, and should there be any difference in beauty, may I not attain perfect Enlightenment. If, when I attain Buddhahood, humans and devas in my land should not remember all their previous lives, not knowing even the events which occurred during the previous hundred thousand kotis of nayutas of kalpas, may I not attain perfect Enlightenment. If, when I attain Buddhahood, humans and devas in my land should not possess the divine eye of seeing even a hundred thousand kotis of nayutas of Buddha-lands, may I not attain perfect Enlightenment. If, when I attain Buddhahood, humans and devas in my land should not possess the divine ear of hearing [268a] the teachings of at least a hundred thousand kotis of nayutas of Buddhas and should not remember all of them, may I not attain perfect Enlightenment. If, when I attain Buddhahood, humans and devas in my land should not possess the faculty of knowing the thoughts of others, at least those of all sentient beings living in a hundred thousand kotis of nayutas of Buddha-lands, may I not attain perfect Enlightenment. If, when I attain Buddhahood, humans and devas in my land should not possess the supernatural power of travelling anywhere in one instant, even beyond a hundred thousand kotis of nayutas of Buddha-lands, may I not attain perfect Enlightenment. If, when I attain Buddhahood, humans and devas in my land should give rise to thoughts of self-attachment, may I not attain perfect Enlightenment. If, when I attain Buddhahood, humans and devas in my land should not dwell in the Definitely Assured State and unfailingly reach Nirvana, may I not attain perfect Enlightenment. If, when I attain Buddhahood, my light should be limited, unable to illuminate at least a hundred thousand kotis of nayutas of Buddha-lands, may I not attain perfect Enlightenment. If, when I attain Buddhahood, my life-span should be limited, even to the extent of a hundred thousand kotis of nayutas of kalpas, may I not attain perfect Enlightenment. If, when I attain Buddhahood, the number of the shravakas in my land could be known, even if all the beings and pratyekabuddhas living in this universe of a thousand million worlds should count them during a hundred thousand kalpas, may I not attain perfect Enlightenment. If, when I attain Buddhahood, humans and devas in my land should have limited life-spans, except when they wish to shorten them in accordance with their original vows, may I not attain perfect Enlightenment. If, when I attain Buddhahood, humans and devas in my land should even hear of any wrongdoing, may I not attain perfect Enlightenment. If, when I attain Buddhahood, innumerable Buddhas in the land of the ten quarters should not all praise and glorify my Name, may I not attain perfect Enlightenment. If, when I attain Buddhahood, sentient beings in the lands of the ten quarters who sincerely and joyfully entrust themselves to me, desire to be born in my land, and call my Name, even ten times, should not be born there, may I not attain perfect Enlightenment. Excluded, however, are those who commit the five gravest offenses and abuse the right Dharma. If, when I attain Buddhahood, sentient beings in the lands of the ten quarters, who awaken aspiration for Enlightenment, do various meritorious deeds [268b] and sincerely desire to be born in my land, should not, at their death, see me appear before them surrounded by a multitude of sages, may I not attain perfect Enlightenment. If, when I attain Buddhahood, sentient beings in the lands of the ten quarters who, having heard my Name, concentrate their thoughts on my land, do various meritorious deeds and sincerely transfer their merits towards my land with a desire to be born there, should not eventually fulfill their aspiration, may I not attain perfect Enlightenment. If, when I attain Buddhahood, humans and devas in my land should not all be endowed with the thirty-two physical characteristics of a Great Man, may I not attain perfect Enlightenment. If, when I attain Buddhahood, bodhisattvas in the Buddha-lands of other quarters who visit my land should not ultimately and unfailingly reach the Stage of Becoming a Buddha after One More Life, may I not attain perfect Enlightenment. Excepted are those who wish to teach and guide sentient beings in accordance with their original vows. For they wear the armor of great vows, accumulate merits, deliver all beings from birth-and-death, visit Buddha-lands to perform the bodhisattva practices, make offerings to Buddhas, Tathagatas, throughout the ten quarters, enlighten uncountable sentient beings as numerous as the sands of the River Ganges, and establish them in the highest, perfect Enlightenment. Such bodhisattvas transcend the course of practice of the ordinary bodhisattva stages, manifest the practices of all the bodhisattva stages, and actually cultivate the virtues of Samantabhadra. If, when I attain Buddhahood, bodhisattvas in my land, in order to make offerings to Buddhas through my transcendent power, should not be able to reach immeasurable and innumerable kotis of nayutas of Buddha-lands in as short a time as it takes to eat a meal, may I not attain perfect Enlightenment. If, when I attain Buddhahood, bodhisattvas in my land should not be able, as they wish, to perform meritorious acts of worshipping the Buddhas with the offerings of their choice, may I not attain perfect Enlightenment. If, when I attain Buddhahood, sentient beings should be able, even with the divine eye, to distinguish by name and calculate by number all the myriads of manifestations provided for the humans and devas in my land, which are glorious and resplendent and have exquisite details beyond description, may I not attain perfect Enlightenment. If, when I attain Buddhahood, bodhisattvas in my land, even those with little store of merit, should not be able to [268c] see the Bodhi-tree which has countless colors and is four million li in height, may I not attain perfect Enlightenment. If, when I attain Buddhahood, bodhisattvas in my land should not acquire eloquence and wisdom in upholding sutras and reciting and expounding them, may I not attain perfect Enlightenment. If, when I attain Buddhahood, my land should not be resplendent, revealing in its light all the immeasurable, innumerable and inconceivable Buddha-lands, like images reflected in a clear mirror, may I not attain perfect Enlightenment. If, when I attain Buddhahood, all the myriads of manifestations in my land, from the ground to the sky, such as palaces, pavilions, ponds, streams and trees, should not be composed of both countless treasures, which surpass in supreme excellence anything in the worlds of humans and devas, and of a hundred thousand kinds of aromatic wood, whose fragrance pervades all the worlds of the ten quarters, causing all bodhisattvas who sense it to perform Buddhist practices, then may I not attain perfect Enlightenment. If, when I attain Buddhahood, sentient beings in the immeasurable and inconceivable Buddha-lands of the ten quarters, who have heard my Name, should not gain the bodhisattva's insight into the non-arising of all dharmas and should not acquire various profound dharanis, may I not attain perfect Enlightenment. If, when I attain Buddhahood, bodhisattvas in the immeasurable and inconceivable Buddha-lands of the ten quarters, who have heard my Name, should not, after the end of their lives, always perform sacred practices until they reach Buddhahood, may I not attain perfect Enlightenment. If, when I attain Buddhahood, humans and devas in the immeasurable and inconceivable Buddha-lands of the ten quarters, who having heard my Name, prostrate themselves on the ground to revere and worship me, rejoice [269a] in faith, and perform bodhisattva practices, should not be respected by all devas and people of the world, may I not attain perfect Enlightenment. If, when I attain Buddhahood, humans and devas in my land should not obtain clothing, as soon as such a desire arises in their minds, and if the fine robes as prescribed and praised by the Buddhas should not be spontaneously provided for them to wear, and if these clothes should need sewing, bleaching, dyeing or washing, may I not attain perfect Enlightenment. If, when I attain Buddhahood, humans and devas in my land should not enjoy happiness and pleasure comparable to that of a monk who has exhausted all the passions, may I not attain perfect Enlightenment. 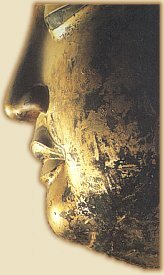 If, when I attain Buddhahood, the bodhisattvas in my land who wish to see the immeasurable glorious Buddha-lands of the ten quarters, should not be able to view all of them reflected in the jewelled trees, just as one sees one's face reflected in a clear mirror, may I not attain perfect Enlightenment. If, when I attain Buddhahood, bodhisattvas in the lands of the other quarters who hear my Name should, at any time before becoming Buddhas, have impaired, inferior or incomplete sense organs, may I not attain perfect Enlightenment. If, when I attain Buddhahood, bodhisattvas in the lands of the other quarters who hear my Name should not all attain the samadhi called 'pure emancipation' and, while dwelling therein, without losing concentration, should not be able to make offerings in one instant to immeasurable and inconceivable Buddhas, World-Honored Ones, may I not attain perfect Enlightenment. If, when I attain Buddhahood, bodhisattvas in the lands of the other quarters who hear my Name should not be reborn into noble families after their death, may I not attain perfect Enlightenment. If, when I attain Buddhahood, bodhisattvas in the lands of the other quarters who hear my Name should not rejoice so greatly as to dance and perform the bodhisattva practices and should not acquire stores of merit, may I not attain perfect Enlightenment. If, when I attain Buddhahood, bodhisattvas in the lands of the other quarters who hear my Name should not all attain the samadhi called 'universal equality' and, while dwelling therein, should not always be able to see all the immeasurable and inconceivable Tathagatas until those bodhisattvas, too, become Buddhas, may I not attain perfect Enlightenment. If, when I attain Buddhahood, bodhisattvas in my land should not be able to hear spontaneously whatever teachings they may wish, [269b] may I not attain perfect Enlightenment. If, when I attain Buddhahood, bodhisattvas in the lands of the other quarters who hear my Name should not instantly reach the Stage of Non-retrogression, may I not attain perfect Enlightenment. If, when I attain Buddhahood, bodhisattvas in the lands of the other quarters who hear my Name should not instantly gain the first, second and third insights into the nature of dharmas and firmly abide in the truths realized by all the Buddhas, may I not attain perfect Enlightenment." There are two different traditions in the Bodhisattva vows -- the Chinese and the Tibetan. In the Chinese tradition, the vows for lay followers and monks and nuns are different. The Chinese version for ordained people has ten root vows and forty-eight secondary vows. Although the listing of the vows is not the same, they are very similar to the Tibetan tradition. Below explanation follows the Tibetan tradition. The bodhisattva (or bodhicitta) vows comprise 18 root and 46 secondary vows. These vows have been compiled in the Tibetan tradition from various authoritative texts. Breaking a root vow completely breaks your bodhichitta ordination, whereas breaking a secondary or branch vow does not completely break your ordination, but damages it. Even if you have not taken the vows, they are useful as guidelines in how to properly engage in Bodhisattva practices. This will also help strengthen aspiring bodhicitta. One should take the time to become familiar with the vows before taking them. That way you can avoid the discovery later on that you are unable to keep them. These vows are quite a commitment, as they are not just taken for this life, but all future lives as well! The following description of the bodhichitta vows is given according to the ”Compendium of Trainings by Shantideva the Luminous Jewel Garland of Instructions on the Three Vows” by Gelong Tsewang Samdrub, and the teachings by Geshe Tashi in London (February and March 2001) which were based on Lama Tsong Khapa's commentary. Praising yourself and denigrating others. You must avoid praising yourself and, with delusion, criticising and denigrating others through wanting to gain offerings, respect or some sort of profit. Praising yourself and criticising, denigrating or complaining about others creates heavy negative karma as well as breaking this root bodhicitta vow. Not giving wealth and Dharma. If you refuse to help others with financial assistance or Dharma teachings when you are able to do so in response to their requests, you will break this root vow. You must practise generosity of material things and generosity of Dharma to those who are suffering, confused and dissatisfied. You should teach those who want teachings and show them how to meditate and remove their suffering. This root vow is part of the perfection of generosity. Not forgiving though someone apologises. Refusing to accept the apology of someone who wrongs you and then apologises, breaks this root vow. Also, if someone breaks vows or precepts and confesses that negative action to you, you must be prepared to accept their confession. If you reject the Mahayana, or any part of it, saying that it is not the teaching of the Buddha, you will break this root vow. To some, the Mahayana seems complicated and overly mystical. The teachings assert the existence of countless manifestations of Buddhas and Bodhisattvas. Some people are unable to come to grips with this vast scope and such things as the sophisticated tantric methods contained in the Mahayana. They may come to think, or even say to others, 'The Mahayana is mixed with non-Buddhist practices. It is not a pure teaching of the Buddha as is Theravada.' By thinking in this way you abandon the Mahayana and break this vow. You break this root vow if you steal anything that was offered, or intended to be offered, to the Three Jewels. Even stealing from others or taking things intended for others will break this vow. Criticising or claiming that any part of the Theravada, Mahayana or Vajrayana is not part of the Buddha's teachings will incur this root downfall. You should not criticise or denigrate a teaching from the Vinaya, sutra or Abhidharma baskets of the Dharma. If you force monks or nuns to give up their ordination by disrobing, or force them to do actions which break their ordination, you break this root vow. Harming the Sangha must be avoided as they are essential to the continuation of Buddhist teachings. The five heinous karmas are killing one's father, killing one's mother, killing a Foe Destroyer (Arhat), wounding a Buddha and creating a schism in the Sangha. Doing any of these very heavy negative actions will break this root vow. Wrong views are such as denying the existence of the Three Jewels, the law of cause and effect, the conventional and ultimate truths, the four noble truths, the twelve links of Dependent Origination and so on. Holding such wrong views will break this root vow because you will be unable even to benefit yourself, let alone others. For example, by denying karma you will not be concerned about the consequences of your actions and, with such carelessness, will continue to create negative karma and hurt others. If you completely destroy any place inhabited by living beings, you will break this root vow. Destroying a city or country habitat, whether by means of fire, bombs, black magic or any other means, will kill many living beings. If you teach the profound subject of emptiness to those who are not able to interpret it properly, or perhaps do not wish to practise it anyway, you will break this root vow. The danger is that some may misinterpret emptiness to mean nothingness, or non-existence, and fall to the nihilist extreme denying the relationship of cause and effect. The true meaning of the emptiness of inherent existence of self and phenomena is very profound and difficult to understand. Many believe that the great Acharya Nagarjuna, who strongly propagated this system, was a nihilist, but this was because they missed the brilliant subtlety of his thought. You should therefore only teach the final view of the nature of phenomenon to those who are ripe to understand it. Reversing others' aspiration for complete enlightenment. Inducing someone who is practising the Mahayana into the Theravada path will break this root vow. If you were to tell someone that the six perfections are beyond his capacity and suggest that, since he will never attain enlightenment, it is better to practise the Theravada - whereby liberation is attained quickly. You will then lead him or her from a greater goal into a lesser one and break this root vow. Causing someone to abandon individual liberation. You must not cause others to abandon their individual liberation vows, whether they be the two hundred and fifty three precepts of a monk, the thirty-six precepts of a novice, the eight or five precepts of a layman, or the practice of the ten virtues. You should never suggest that these are part of the lesser vehicle and not important for the Mahayanist. Neither should you encourage someone to ignore their vow not to drink alcohol, or other vows, by implying that such vows are of a lower level than the Vajrayana vows and therefore not important. If you cause others to abandon their individual liberation vows, you will break this root vow. If you disparage the Theravada with a negative mind, especially in the presence of a Hinayanist, you break this root bodhichitta vow. Some say that the Theravada is a very low vehicle and it takes a long time to traverse that path, and therefore it is better that to practise the great Mahayana and rapid Vajrayana. This is not a suitable attitude because both the Hearer and Solitary Realiser paths lead to liberation and to the realisation of renunciation, which are fundamental to the Mahayana path. Falsely claiming to have realised emptiness. Falsely claiming to have the full realisation of the emptiness of inherent existence of self and phenomena breaks this root vow. It is a specific form of lying, whereby you deceive others into believing that you have special attainments. It is not necessary to claim explicitly that you have high realisations to break this vow. Just implying that you have high realisations also incurs the downfall. An example would be to suggest to others that if they practise according to your instructions they will also gain great powers and spiritual attainments. Or to say, 'If you practise the three principal paths diligently you will gain similar experiences of bliss to my own!' The Buddha said that even when you have attained the paths of insight or liberation you should never openly say to others, 'I have this or that realisation' or 'I have attained this or that path'. Publicly stating such things will only cause confusion and suspicion. Cynics will believe that you are lying to improve your status and reputation, and the gullible will follow you blindly rather than because of the quality of your teachings. Deceiving other people into thinking that you have realisations when you do not is particularly dangerous. Tibetans have a poor opinion of the person who boasts about his qualities and claims to have special clairvoyance or an ability to communicate with the Buddhas. On the other hand, we have the greatest respect for the truly humble practitioner who hides his attainments and leads a quiet and simple life practising the Dharma diligently. Receiving the property of the Three Jewels. If you accept things that were originally offered to the Three Jewels, then stolen or misappropriated and given to you, you will break this root vow. It also refers to people such as kings or government ministers who use their position of power to unjustly acquire wealth and then pass some or all of it on to you. Accepting such gifts is a form of wrong livelihood. The person practising concentration giving his belongings to others. Where a yogi, engaged in a concentration retreat, reluctantly accepts the offerings of a benefactor and then with some anger gives the offerings to others who are not seriously engaged in Dharma practice, he will incur this root downfall. If you give up your aspiration to attain enlightenment, or your determination to benefit all living beings, or any single living being for that matter, you will incur this downfall. Having taken a vow to benefit all living beings, to give up this purpose is to abandon them and doing so cheats all living beings. You destroy the very basis of your Mahayana practice. If you break Vows 9 or 18, you break completely your bodhichitta ordination, without requiring any of the below four conditions to be present. Not thinking of the action as faulty. Not intending to abstain from the action in future, or retaining the continuous desire to break the precept. Rejoicing in the action, or enjoying having broken the vow. Not having any regret about the action. Killing, stealing, sexual misconduct, lying and so on are not complete negative karmas if the four factors (above) are not present. If you were to break any of the root vows other than the 9th and 18th and then had sincere regret, or otherwise reversed the four factors, your bodhichitta ordination would not be completely broken. Having taken the bodhichitta vows, you should endeavour to keep them purely. If you transgress your vows then you should regret doing so and quickly practise purification. In that way your development of bodhichitta will progress without interruption. Besides the 18 root vows, there are 46 secondary (branch) vows. Together they form the method for developing bodhichitta and prevent it from degenerating. The vows are therefore the source of happiness and the way to avoid harm to living beings. Vow one through seven are related to the perfection of generosity. Neglecting to pay homage to the Three Jewels each day. Having taken the bodhichitta vows it is necessary to accumulate merit. You should therefore take refuge in the Three Jewels, make physical offerings and prostrations, verbal praises, requests and mental homage each day. Following the mind of desire. If you do not restrain yourself from acting out delusions, indulging in desire, and do not know contentment, you will constantly grasp at material comforts and the enjoyments of cyclic existence and break this branch vow. Elder Bodhisattvas, that is those who have taken the bodhichitta vows before you, are objects of respect and objects of offering. Not showing them respect will break this branch vow. When someone trusts you and sincerely asks a question of you, and if you become angry or, due to laziness do not give the appropriate answer, you will break this branch vow. Any time that you avoid skilfully and appropriately answering questions on the Dharma and other matters is an infraction of this branch vow. For example, if somebody asks you to explain how to meditate on impermanence and you respond with an explanation of bodhichitta, you will have broken this vow. Even if you respond on the subject of impermanence, but in an inappropriate or unsatisfactory way, that is an infraction. This branch vow applies whether you have full ordination or lay vows, and also with respect to the practice of the ten virtues, about unconditioned phenomena, such as space or emptiness. If you decline an invitation without a proper, valid reason, that is an infraction of this vow. The vow specifically refers to refusing an invitation because of anger, jealousy, and laziness and so on. It is acceptable to decline an invitation if you have a good reason for doing so. For example, you may be sick, too busy, doing a retreat, or if accepting the invitation could cause an obstacle to your Dharma practice or cause others to be unhappy or jealous. When people invite you to their home for dinner, they are extending their friendship. A refusal will cause them to feel rejected and make them unhappy. So, in general you should try to accept invitations but, before you do, check first to ensure that you will not be led into creating negative karma or breaking a vow. For example, if you have a vow not to drink alcohol and are invited to a function where old friends may put a lot of pressure on you to drink, then it may be best to refuse such an invitation politely and gently. Not accepting gold and so on. When a benefactor sincerely offers gold, silver or other precious things, to decline them through malice, anger or laziness breaks this branch vow. Not giving the Dharma to those who desire it. Refusing to teach the Dharma to those who genuinely wish to learn and practise it because of delusions such as anger, jealousy or laziness is an infraction of this vow. There are valid reasons not to give teachings, such as being to busy, not familiar with the subject, believing that there is not a suitable time, or that the student lacks faith. In those cases it is acceptable not to teach, but to refuse to teach the dharma due to laziness and so on breaks this vow. Related to the perfection of ethical self-discipline. Forsaking those who have broken their moral discipline. These people will need advice and help with releiving their guilt. They should not be treated with contempt or be ignored. Not observing the Theravada trainings in order to generate or sustain faith in others. If, for example one breaks the monastic vows saying 'I need to help others', but with the motivation of gaining others' respect. Doing little to benefit other sentient beings. Bodhisattvas need not observe the Vinaya disciplines exactly in the same manner as the Theravada. For instance, the minor rule for an ordained person not to keep new robes for more than ten days without blessing them is not a natural negativity but a negativity decree; that is, a decree of the Buddha for the ordained. However, to place too much importance on such minor rules compared to taking opportunities to benefit other living beings will incur this downfall. You must compare which course of action will serve the greater purpose and act to provide the greatest benefit to other living beings When you are in a situation where you can help another living being, but doing so requires that you transgress one of the Vinaya rules and you pull back from helping by thinking, 'I should not break a vow', then you incur this downfall. Not knowing the full purpose of compassion. If it serves a special purpose for others, it is permissible for a Bodhisattva to commit the seven non-virtues of body and speech. If you refuse to commit a such a non-virtue, when by doing so you could help numberless sentient beings, you will incur this downfall. Generally, you have to avoid all non-virtues. But when the circumstances arise in which, through compassion, you can help numberless sentient beings by engaging in one of the seven non-virtues of body and speech, then you must do so. For instance, suppose you were living in the country and a hunter came by and asked you whether you had seen any deer. If you had seen some and decided not to lie, you would keep your Vinaya precepts and retain observance of the seven virtues, but the hunter would kill the deer. In this case you should rather tell a lie than follow the normal rule. This judgement obviously requires wisdom. Deliberately accepting things which are acquired by wrong livelihood. If, with selfish motivation you deliberately acquire wealth, reputation and so on by any of the five wrong livelihoods you incur this downfall. a) Hypocrisy: for example acting as though you are a great and holy lama full of love, compassion and limitless insight in order to win the devotion offerings of others. d) Artful acquisition is gaining things by sneaky methods or pressuring others. For example, by insulting them about their miserliness and lack of caring for the desperate plight of such deserving individuals as your good self. e) Seeking reward for favour is giving a small gift in the expectation that you will get something much greater in return. Indulging in frivolity with agitation, delusion and lack of mindfulness you make fun of others, laugh loudly, make loud noises and so on, you incur this downfall. Being agitated in this way is an obstacle to concentration and the practice of Dharma because your attachment will be increased. If you are constantly joking, singing, dancing, drinking and carrying on, you will be unable to concentrate and will also distract other people, It is acceptable to sing, listen to music, laugh, joke and so on if you have a good purpose for doing so. If, with compassion and love, you want to relax or cause others to be relaxed and happy, then singing, joking and the like can be useful. The branch vow refers to doing these things through agitation and delusion. Claiming Bodhisattvas should remain in cyclic existence. Holding the view that Bodhisattvas should not be attracted to liberation, not be afraid of delusion and not to become separate from delusion, but rather that a Bodhisattva's job is to roam in cyclic existence for three countless aeons while cultivating enlightenment, incurs this downfall. Such an attitude shows that you do not understand the nature of cyclic existence, delusion and the Bodhisattva path. Instead, a Bodhisattva is to achieve liberation and full enlightenment in order to be of greatest benefit to others. A bodhisattva can often help others better when having a good reputation. Even joking too much can be tricky when people misunderstand one's real intentions. Also, when others criticise you and damage your reputation. you should endeavour to clear your name. Not employing the methods to overcome others' negativities. If it is possible to overcome others' negativities of body and speech through forceful methods, but you elect to use flattery and help them save face instead, you incur this downfall. You should make an effort and use all your skill and suitable methods to help those who create negative actions, break their vows, harm others and so on. Where possible, teach them ways to purify negative karma, such as the 4 opponent powers, and practise such methods yourself as an example. These four noble disciplines are said to distinguish a real practitioner, as they refer to the causes of anger and lack of patience. If you retaliate in any of the four circumstances you break this branch vow. Not caring about those who are angry. Do not add fuel to the anger of others by neglecting or ignoring those who are angry with you. Instead of closing yourself off, try to communicate and dissipate their anger. If you cause a problem for others or you have suspicious projections that they are harming you, and then through pride, laziness, malice or other delusions you do not clear the air by apologising when you have the opportunity you incur this downfall. If others harm you and then apologise according to the Dharma, but through malice or resentment you do not accept their apology you will incur this downfall. This vow is the same as the third root vow except that the four conditions are not required here to break it. Not checking the angry mind or acting out thoughts of anger. When you become angry with someone and make no effort to try to control anger but let it continue unchecked instead, you incur this downfall. Vow 21 through 23 relate to the perfection of joyous effort. Gathering a circle of followers because of desiring wealth and fame. If you gather a circle of followers and other people for the selfish purpose of gaining respect. fame, profit, praise or security, you will incur this downfall. Not eliminating the three types of laziness. The three types are: sloth, attraction to negative actions and self-pity or discouragement. If due to laziness, you sleep excessively during the day or late in the morning but you do not make an effort to eliminate laziness you break this branch vow. Note that laziness is not just being non-active, one can very well be hyper-active in useless or negative activities and because of that be spiritually lazy. Engaging in senseless talk through attachment. If you waste your time gossiping with attachment about royal families, politics, wars, relationships, divorce, crimes and so on, you incur this downfall. Not seeking the meaning of concentration. Not removing obstacles to concentration. There are five obstacles to concentration: (1) agitation and regret (2) malicious thoughts, (3) sleep and sloth, (4) longing desire, and (5) doubt. Not making an effort to overcome these obstacles when they arise causes you to break this branch vow. Viewing the taste of concentration as being its main quality. The 'taste of concentration' refers to the bliss and pliancy that arise from this practice. The main quality, or real purpose, of concentration is to prepare the mind to be able to engage the very subtle object that is the true nature of phenomena, its emptiness of inherent existence and the development of compassion. If you become attached to the taste of bliss and pliancy while viewing it as being the main quality, or real purpose, of concentration, you will incur this downfall. Although it may be acceptable for Hearers and Solitary Realisers to enjoy the complete relaxation, peace and bliss of concentration for long periods; because the Bodhisattva is bound to help other living beings, he should not waste time like this, but move on to realising emptiness and developing compassion. Vow 27 through 34 relate to the perfection of wisdom. To assert that listening to the Theravada, memorising its texts and engaging in its practices, though necessary for the Theravada, is not required by Bodhisattvas, or to proclaim this to others, will incur this downfall, A Bodhisattva must tread the small and medium scope paths in common with the Theravada Hearers and Solitary Realisers to gain the proper foundation for the explicitly Mahayana practices of the great scope. A Bodhisattva must also be able to communicate the Dharma to all living beings, many of whom will have the Theravada potential, so it is important to know the Theravada path. This vow looks similar to the root vow 13, but that vow refers mostly to vows of individual liberation, and this secondary vow one relates mainly to the Theravada explanation of selflessness. Applying great effort to the Theravada while currently engaged in the Mahayana. When you have become fully involved in the Bodhisattva practices and you set them aside and engage in the Theravada practices instead, you will incur this downfall. To be able to benefit all living beings requires that you make use of the precious opportunity to practise the Mahayana. The keyword here is balance; study the Theravada, but do not forget to put effort on the Mahayana practices. Applying effort to non-Buddhist teachings while currently engaged in the Buddhadharma. When involved in the Buddha Dharma, if you set this practice aside in preference for the study of non-Buddhist systems, you will incur this downfall. Generally, studying these systems will strengthen the wrong view holding an inherently existent self. If however you have a good reason, such as wishing to be able to communicate with people from other religious backgrounds, then it is acceptable to study their systems. Excessive involvement in non-Buddhist subjects. With a specific purpose in mind, you will sometimes have to study non-Buddhist texts but if you allow yourself to become attached to them, completely involved and take great pleasure in them you will break this branch vow. Denigrating any Mahayana teaching or teacher, and suggesting that they are of no benefit and will not help others, will incur this downfall. Although is looks similar to the root vow 4, this vow specifically relates to the teachings and practice of wisdom of emptiness. When, motivated by pride or anger, you praise yourself and denigrate others you incur this downfall, this is the same as the first root vow except that the four conditions are not required to break it. Making no effort to study Dharma. If through pride or laziness you do not go to teachings, Dharma discussions and so on you will break this branch vow. It relates mainly to the realisation of wisdom, for which one needs to study. Deriding guru and word rather than relying on the meaning. If instead of viewing your guru as a Buddha and making offerings, you knowingly deride him or make fun of him. And, if instead of relying on the meaning of the teachings, you rely on the words instead of their meaning or you chase after pleasant sounding words instead of the teachings, you will incur this downfall. Vows 35 through 45 relate to the perfection of going to the assistance of those in need, or the "11 ways of benefiting others". Neglect to help whoever needs assistance. Not providing counselling, teaching, protection, shelter, guidance and so on when you have the opportunity and capability to do so, but through anger, laziness or other delusions you decline to help, you will break this branch vow. This relates especially to situations where you promised to help. Avoiding taking care of those who are sick. Not dispelling sufferings of others. If through anger or laziness you do not skilfully guide those who are wrongly involved in the purposes of the present and future you will incur this branch downfall. Recklessness relates to a lack of consideration for others. If through malicious thoughts or laziness, you fail to repay the kindness of others who have helped you or been generous you will break this branch vow. Not relieving the grief of others. If, due to malice or laziness, you do not dispel the grief of relatives, friends and others who are stricken with misfortune, poverty, depression and so on, you will break this branch vow. Refusing charity to the needy. If someone asks for charity and due to malice or laziness you refuse him or her, you will incur this downfall. If, however, there are good reason not to give them something, like when it would cause them harm then it is suitable not to give. Not taking care of friends, disciples, servants etc. If you do not give teachings and look after the wellfare of people who trust in you, you will incur this downfall. Not being considerate of the wishes of others. If you do not act agreeably toward others due to laziness or malice, you will break this branch vow. You should avoid arguing with, or harming friends, relatives and those with whom you associate. Rather, be considering and endeavour to respond to their needs and aspirations, as long as it does not bring harm to oneself or others. Not praising others' good qualities. If, due to malice or laziness, you do not praise the knowledge, virtuous qualities of others, you will incur this downfall. One should encourage others' good qualities and show interest in them instead. Not using force when necessary. If, due to laziness malice, you do not expel, punish or deflate the pride of those who need it, you will incur this branch down-fall. Some situations may require forceful action to stop harm. Not using miracle powers, threatening activities and so on. You should use whatever wrathful or miracle powers you may possess if doing so will benefit other living beings. If you do not use them when appropriate, you will incur this branch downfall. You should be very careful, however, not to make a display if it is not really of great benefit; bodhisattvas should not show their miraculous powers without a good reason. The purpose of keeping the 18 root vows and 46 branch vows is to prevent your bodhichitta degenerating and to make it develop continuously. A person who has taken the bodhichitta vows should endeavour to keep them purely. The bodhichitta vows are the means to help other living beings, the means to avoid harming them and the way to accumulate merit. All positive thoughts and deeds are encompassed by the root and branch bodhichitta vows. You take the bodhichitta vows with the intention to attain enlightenment in order to benefit all living beings. It may take many lifetimes to attain enlightenment. So it is important to ensure not only that your bodhichitta vows do not degenerate during this life, but also that circumstances do not arise that will prevent you from maintaining the practice of the vows in future lives. One must generate sincere regret and the intention not to repeat the same mistake again. Make three prostrations to them. In case one has not really fully broken a root vow, one can optionally restore the vows in front of one person who understands and holds the vows with the same ritual. As a last resort, if there is nobody available, one can restore the vows in front of a Buddha statue or a visualisation. One should realise that after a sincere confession and restoring of the vows, the original negative consequences cannot be undone, but at least the negative karma stops increasing further.